Ride Height and What Rims? 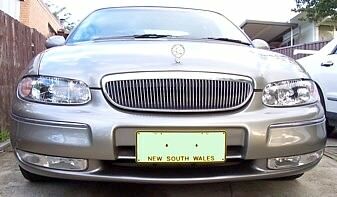 Discussion in 'VT - VX Holden Commodore (1997 - 2002)' started by TriK, Jul 22, 2006. First thing is what type of rim do you think will suit the colour of my car best? Chromies (hope not)? Normal alloy kinda ones not real shiny? Shadow Chrome? Also if i upgrade from the stock rims will it increase my ride height? because i just scrape down on my drivewat at the moment...so im thinkin 1 or 2 cm's would be enough to stop the scraping. PS: if anyone has pictures of my colour car with rims on it id appreciate them too! Bigger rims won't increase the height because the bigger the rim the lower the profile of the tyre making the diameter about the same as the stock tyres. That is if you go from 15inch to 17 inch, which legally, is all you can do anyway as far as I know. I'm sure I will be corrected if I'm wrong. This is my rims (missing the caps) I personaly think VY SS rims would look great. Ahh ok thanks for clearing that up. Yea i have looked at VY SS previously also the ROH FURY and ones similar like yours which is the shape i was leaning towards. Thanks for the pic is helps a lot more than the virtual wheel thing on bobjane.com.au also what springs have you lowered yours on? how much did it cost? doesnt look too low which is what im after. "dumping" my ride would then make me unable to go down my driveway without leaving half the under carriage behind. But yes i do want to lower it...just isnt logical at this point in time. So getting 17's wouldnt look that horrible for the time being would it? i mean i can park it out the front of my house but in Vic Park its dodgey and people key cars too often and bird turd aint good for the mint paint job. So maybe ill invest in a Car Cover. Thanks for the input though, always appreciated. I have 17 at stock height and it's ok. Sometimes it's not practical to lower your car. 17s still look better than 15s no matter what height. VY SS Come in 17's? was trying to find something about em in perth streetcar mag but couldnt find anything. Otherwise ill have a look at some ROH rims. Also off topic a bit sorry. But if i get an exhaust system put on my car and have twin tips will that decrease back pressure? i just like the look of twin tip exhausts but hey if its losing backpressure there aint no point. and perhaps lower it about an inch to sit the car to my liking. Good to hear....is that 2 inch's over stock rule because they believe the car cant handle safely or something? Yea i was thinking of going to a di fillippo place or somewhere else with a reputable name hopefully they supply with stainless steel. Also noticed ur from margaret river....which is where my pics were taken my old man lives down there. yea thats true aye fuel prices and that are crazy. but apart from that wineries, breweries, the beach make it a great place to live. so in my instance it allows an 18" wheel, can go larger.....but I think 18" is large enough. Trik, in WA it is 2 sizes above what the placard says..and the placard is located inside your drivers door near where the lock part acrually latches onto the car. with the exemption of item (f), the tyres and rims are in conformity with the requirements specified above in items (a) to (j). ahh ok thanks guys appreciate the help!